Fall is fast approaching. Well, I take that back. It’s crawling to the Alabama Gulf Coast. The region’s subtropical climate can keep the area in upper 80s to lower 90 degree weather through late September. But fall will arrive. Now we may not have the brightly colored autumn leaves of our friends just to the north of the coast, but camping here when fall and winter arrives is a sheer joy. Temperatures average mid-40s to mid-50s and rarely do they go below freezing. If they do they are short-lived. 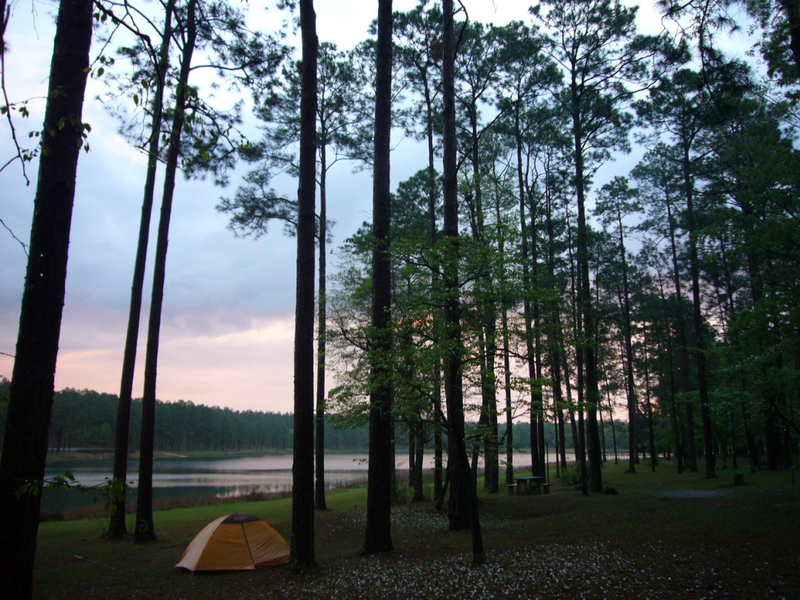 So pack up the tent, bring along some steaks and s’mores for the campfire, and spend an evening or two under the twinkling stars at these great sites that feature some of south Alabama’s best tent camping. You are in for a real treat if you pitch your pop-up tent on one of the four floating camping platforms along the Bartram Canoe Trail . The canoe trail is a series of marked sloughs and bayous through the country’s second largest river delta. The paddle out to the platforms is through a land where time has stood still. The landscape is a picture postcard of what you would expect when you think of a Southern bayou and delta. As you paddle and pitch camp you will be sharing the wilderness with some formidable wildlife including wild hogs, American alligators, and black bear, to name a few. The platforms are anchored so that if the river level rises to 19 feet they will be submerged and you won’t be able to use them. A friendly reminder that if the rivers are at flood stage, you should head home. Each platform is suitable for eight campers and is available free of charge for one night only (12 p.m. to 12 p.m.) but reservations are required. Open fires are not permitted on the platforms only camp stoves. 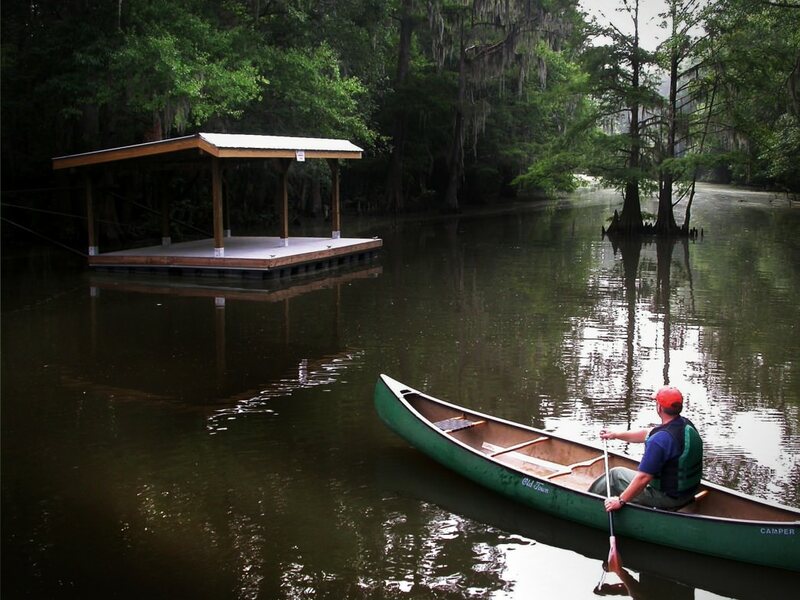 For a complete set of regulations and to learn more about this true deep South adventure visit the official Bartram Canoe Trail website. Most towns and cities across America now have some sort of paved multi-use trails where walkers, cyclists, and joggers share the road to get in some exercise. South Alabama has its own but one in particular stands out—the Hugh Branyon Backcountry Trail in Orange Beach, Alabama, and Gulf State Park. Among the 13-miles of paved path that wind through six different ecosystems you will find the Outpost, a unique camping experience only minutes from Alabama’s Gulf beaches. 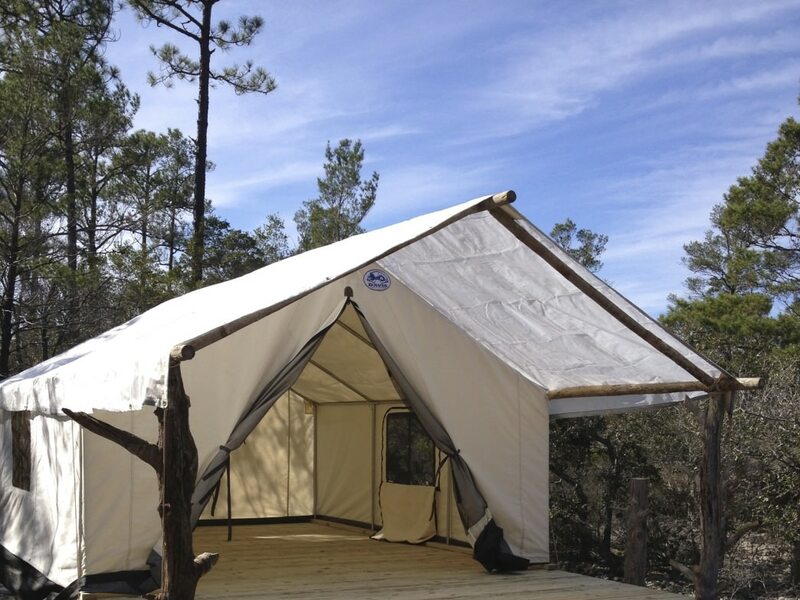 The Outpost has three primitive campsites but instead of having to bring your own tent the sites are outfitted with heavy-duty safari like canvas tents complete with Big Boy cots, four chairs, and even firewood. The tents are situated on top of elevated platforms to keep the critters out like bobcat and alligators in a landscape that Orange Beach Coastal Resources Director Phillip West says resembles that of southwest Arizona. The Outpost is as primitive as can be. You will have to pack in (or bike in) your own water and the nearest restroom is .75 miles away. The nearest bathhouse is 1.8 miles away. Sites can be rented for $50 a night with a two night minimum required on holidays or special-event weekends. To learn more visit the Hugh Branyon Backcountry Trail website. For reservations call 251-948-7275. 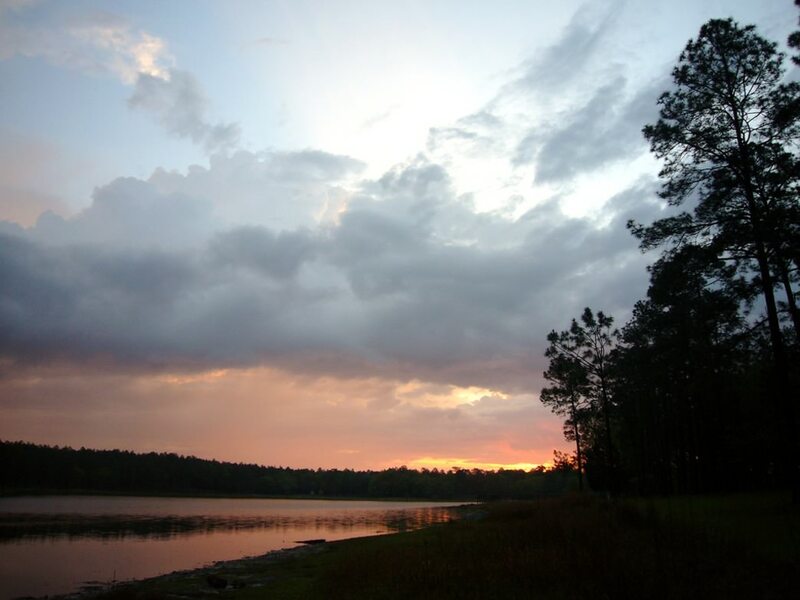 About an hour and a half away from downtown Mobile is the Conecuh National Forest, a beautiful long-leaf pine forest dotted with fast flowing creeks, cypress ponds, pine savannah, and crystal clear blue springs. It’s also the home of the Open Pond Recreation Area . Open Pond is located on the banks of a gorgeous 30-acre lake that reflects the deep blue Southern skies. The wide-open banks offer excellent opportunities for stargazing. It is also an excellent place to wet a line to catch some bass and bream. The recreation area has 65 improved campsites with water and electricity and 10 primitive sites. Improved sites are $12 a night; $6 a night for primitive sites. Pay at the recreation area’s entrance kiosk. Remember, this is a National Forest and hunting is allowed so that means the campground will be crowded during hunting season.